And then I found it in the Lucky Brand Jeans section and I fell in love instantly. 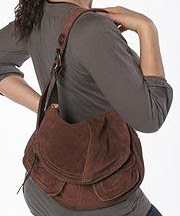 It was everything I was looking for: Big but not Too Big - Soft Leather - Front Pockets - Great Rich Brown Color - Comfortable Strap. And it cost less than any of the bags above (except, of course, for those things Guess keeps calling handbags). Except mine is in leather and not suede. I couldn't find a picture for the leather one, maybe they're not selling it anymore. Even better. Update: I found a picture! Check them out if you need a good quality "casual" bag. Lucky Brand Jeans. I have to admit Lucky makes some really nice bags. hey NY Spender I just got hooked on Lucky Jeans Abbey Road patchwork bag!! 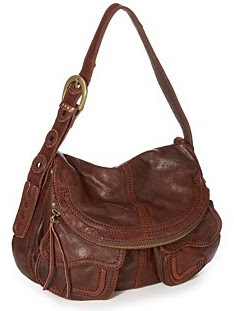 LUV THIS Bag also saved $$$ cause i got it on sale at Macys w/20% off coupon. Im updating all my bags and clothes this year-Out w/the old in with the new! This bag is squishable and its lamb leather is lovely. ikeep taking it out of my closet and admiring it. I won't start using it til sometime next week.